If you watched season 3 of Top Chef which took place in Miami, then you know who Howie Kleinberg is. If you don’t watch then all you need to know is Bulldog Barbecue is his baby. My cousin Fred and I decide to check out the place and Howie happens to be there (we never bothered him, he seemed busy). The place seats 40 and has a very cool vibe to it. The silverware, as well as some sauces and napkins, are hanging tidily on the wall next to our table. We are brought this little metal canister with 2 pieces of cornbread, served cold. Interesting never had it cold before, it was good but it would have been better warm. The BBQ Chicken Flatbread had some good flavors but honestly I can’t get those wings out of my head (Fred at first said he liked the BBQ Chicken Flatbread better then recants his story and agrees with me about the wings). I told you we were out of control. All sandwiches were served on potato rolls, with Chipotle or Sweet Fries and Slaw (I don’t like Coleslaw but Fred loved it enough to eat two portions). We both agreed that of the sandwiches or Biscuits as defined on Bulldog Barbecue’s menu we liked the Portobello Burger best. Plenty of flavor and the caramelized onions were a nice touch. I’m not a giant fan of sweet fries but Fred seemed to dig ’em. The Black Angus Burger was pretty good but what I really liked was the Chipotle Mayo. I think Fred said he liked it so much he wanted to smear it all over himself (a thought that hurts my brain plus we all know only men smear). This is a definite must order item if you come here. Another definite must order is their side of Mac and Cheese. We both loved it. Just a heads up, there does a appear to be some blue cheese in it, which is probably why we liked it so much. At this point, we figured we might as well order a couple of desserts and finish ourselves off. Fred gets the Hot Chocolate Puddin’ Cake and I order the Apple Turnover. Both are outstanding. The Hot Chocolate Puddin’ Cake is a molten chocolate cake with two banana slivers (good choice) on top and a scoop of vanilla ice cream. The Apple Turnover was delicious and flaky. When I couldn’t finish my dessert, Fred gladly helped me out. That’s what friends are for. Sounds like an interesting place and I’m a big sliders fan so I might check this place out. Great review! Bro….that’s a lot of food. An admirable feat, you boys are big league. Way to put it down. I have a cousin who taught me that same wing method a few years ago. It’s by far the greatest trick ever! Dude! Another trick I learned from him is how to remove wing grease from your hands without going to the bathroom. Take a piece of ice from your Coke and rub it in your hands for a bit. Viola! Do you think its a coincidental that we’re both pushing 300 lbs? I don’t. It takes hard work and dedication. I just took down some lunch and I’m already hungry again. Just wanted to say great blog. 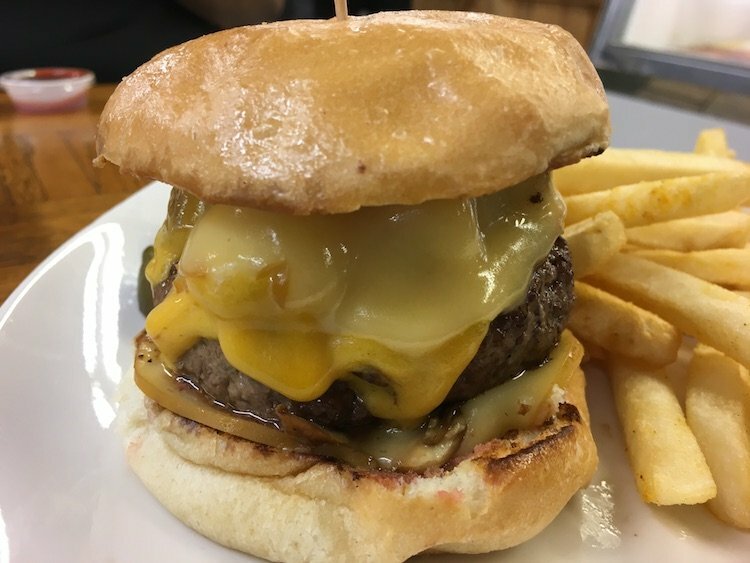 Such a fun read – i mean, who doesn’t have their favorite burger spots. And to throw my two cents in – suggest you check out this little Colombian joint on Coral Way called Al Carbon. They grill all their burgers over hard wood charcoal. Delicious and open till 6am on the weekends! – http://alcarbonusa.com/ Try the criolla burger which has swiss and hogao (a tomato based cheese sauce from Colombia). Unbelievable juicy goodness. Also, they cook your burger to order so if you want it medium, it comes pink in the middle. Good luck with the burger search! You are going to go broke with this website. Looks like a great place! I’m gonna have to ckeck it out next time im in Miami. I really would not call his food barbecue at all. I think there is a lot of liquid smoke involved…. I'd be happy to show him how to use a proper smoker. love the food, wings and burger is one of the best I have had. I now go to bulldog ones a week, I also must say the service is excellent, thank you Manuela you also make it very enjoyable.